It’s true, we LOVE markets! 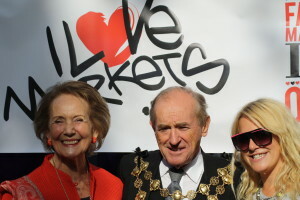 I Love Markets was the founded by Katie Ingham, who is passionate about championing London’s Markets. Once a trader, it was her love for markets that lead her to develop the I Love Markets community and website. Katie was trading at Camden Stables Market at the age of 15 and has also stalled at Portobello Market and Brick Lane selling vintage and retro. She has watched the changing landscape of London’s Market scene over many years. 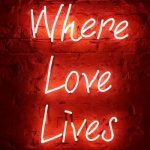 Living in the home county of Hertforshire, it was her desire to recreate the London Market experience online, that inspired her to create I Love Markets. Since 2012 she has devoted her time to visiting and promoting markets and businesses, endlessly spreading her love for London’s Markets! 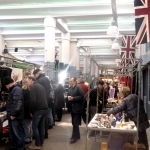 We work closely with London’s local authority Markets, independent market organisers and traders. Katie Ingham is also a regular contributor on BBC London Radio 94.9 where she is described as London’s Market Expert. Katie Ingham (right) with the The Mayor &Mayoress of the Royal Borough of Kensignton and Chelsea. What does I Love Markets do? I Love Markets celebrates London’s markets and all of the wonderful things that can be found within them. No market is the same and we want to help you discover the unique experiences that each one has to offer. Independent businesses and passionate communities are at the heart of the London Market experience. Promoting and raising awareness of market mavericks is a big part of what we do. It’s true, we love markets! 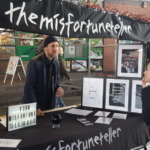 Create a listing for your market stall, shop, eatery or venue. You just need to register to create your listing. A basic listing is free. We also offer additional paid-for features to assist you in promoting your business. London’s markets are something to be proud of. Whether you want to raise awareness of your market, encourage people to visit, promote an event or something else, we are dedicated to supporting you. Create a free basic market directory listing or sign-up to our market membership package to receive bespoke promotion and advertising. Find out more. Be the center of attention by promoting your event, market or business on the I Love Markets. Affordable rates and bespoke packages. Find out more. We have a thriving social media community which grows bigger day by day. If you’re looking to spread the word or promote something, we can help you reach our community, find out more. If you share our love for London’s markets then join us on the networks below.